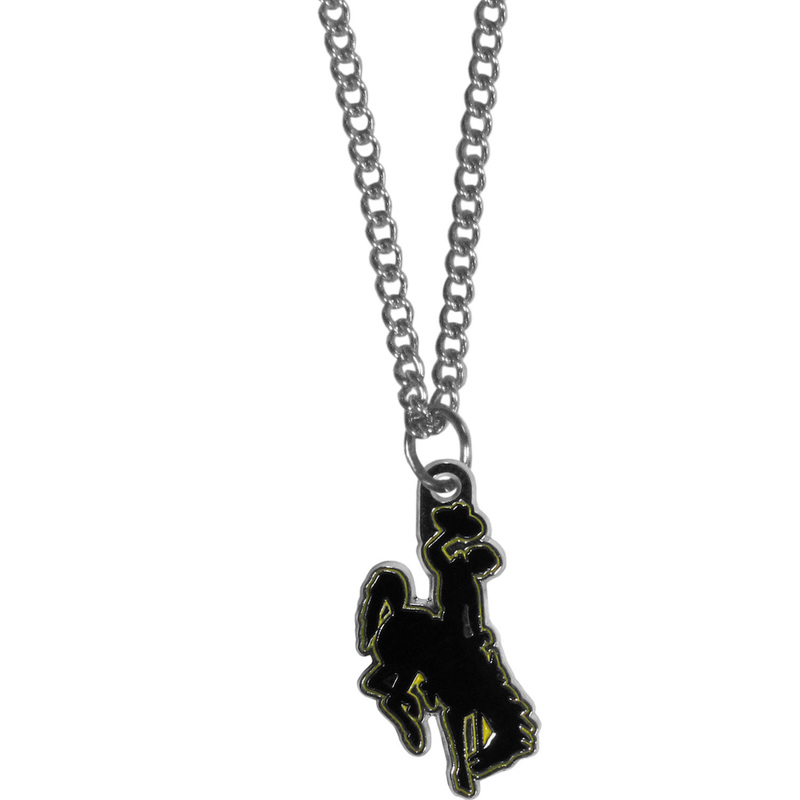 Expertly crafted Wyoming Cowboys tag necklaces featuring fine detailing and a hand enameled finish with chrome accents. 26 inch ball chain. 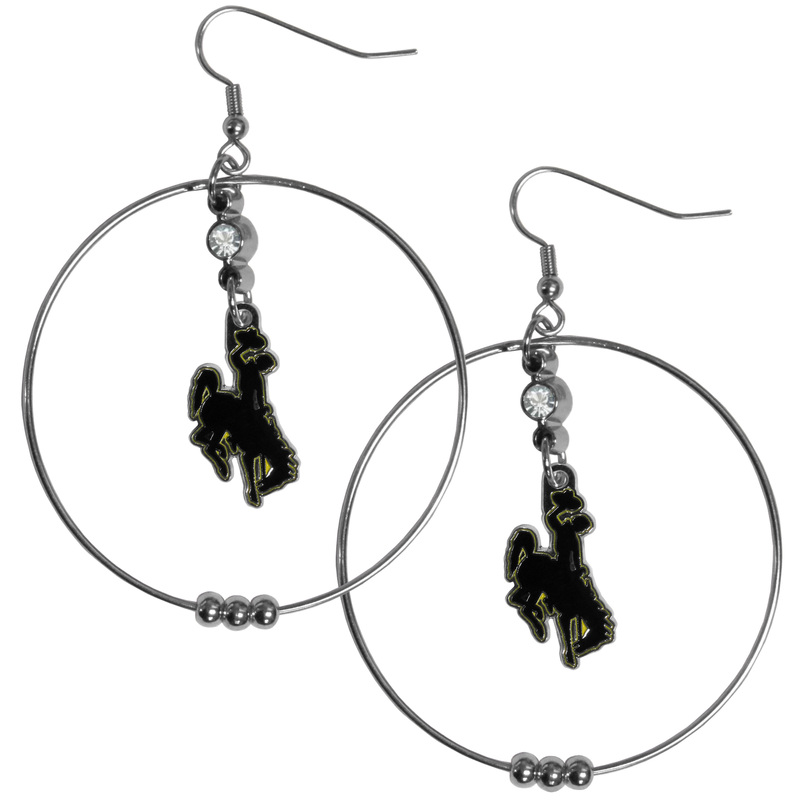 Our large hoop earrings have a fully cast and enameled Wyoming Cowboy charm with enameled detail and a high polish nickel free chrome finish and rhinestone access. Hypoallergenic fishhook posts. Flash your Wyoming Cowboys spirit with this bright stretch bracelet. This new bracelet features multicolored team beads on stretch cord with a nickel-free enameled chrome team charm. This bracelet adds the perfect pop of color to your game day accessories. 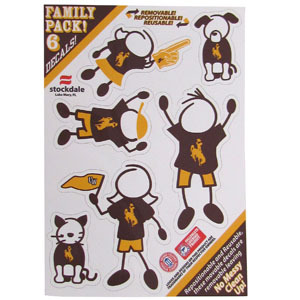 Our officially licensed game day shades are the perfect accessory for the devoted Wyoming Cowboy fan! The sunglasses have durable polycarbonate frames with flex hinges for comfort and damage resistance. The lenses feature brightly colored team clings that are perforated for visibility. Our functional and fashionable Wyoming Cowboy survivor bracelets contain 2 individual 300lb test paracord rated cords that are each 5 feet long. The team colored cords can be pulled apart to be used in any number of emergencies and look great while worn. The bracelet features a team emblem on the clasp. Our functional and fashionable Wyoming Cowboy camo survivor bracelets contain 2 individual 300lb test paracord rated cords that are each 5 feet long. The camo cords can be pulled apart to be used in any number of emergencies and look great while worn. The bracelet features a team emblem on the clasp. Make a statement with our collegiate chain necklaces. 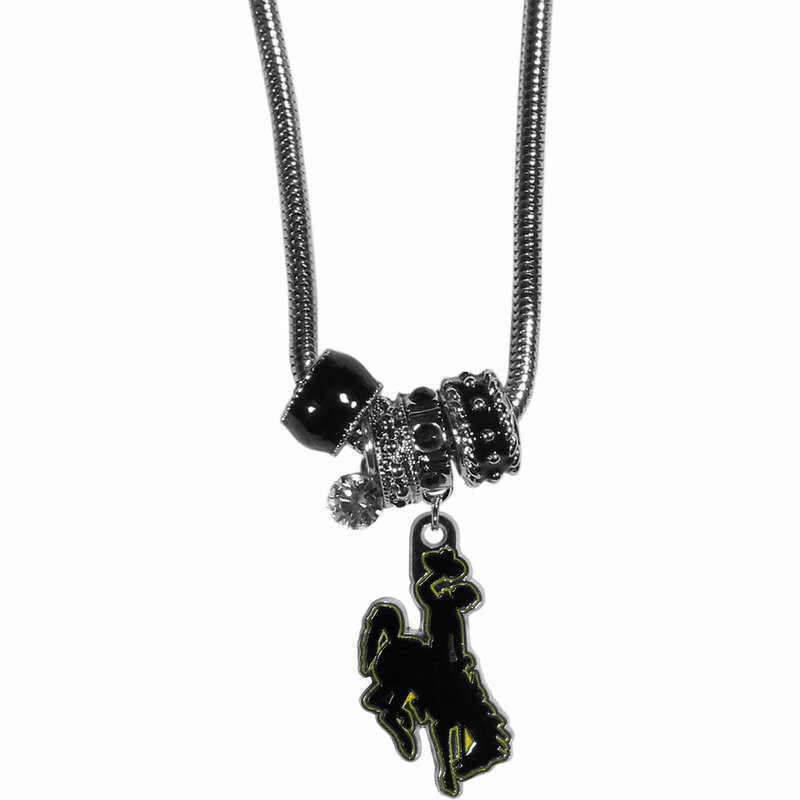 The 22 inch chain features a fully cast, high polish Wyoming Cowboy pendant with vivid enameled details. Perfect accessory for game day and nice enough to wear everyday! Our classic single charm bracelet is a great way to show off your team pride! 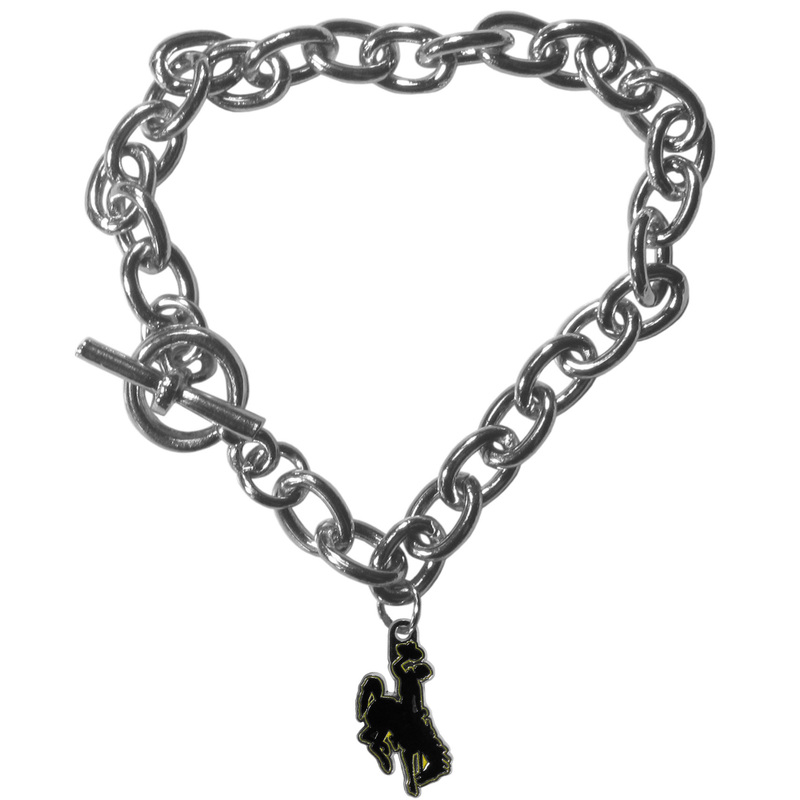 The 7.5 inch large link chain features a high polish Wyoming Cowboy charm and features a toggle clasp which makes it super easy to take on and off. 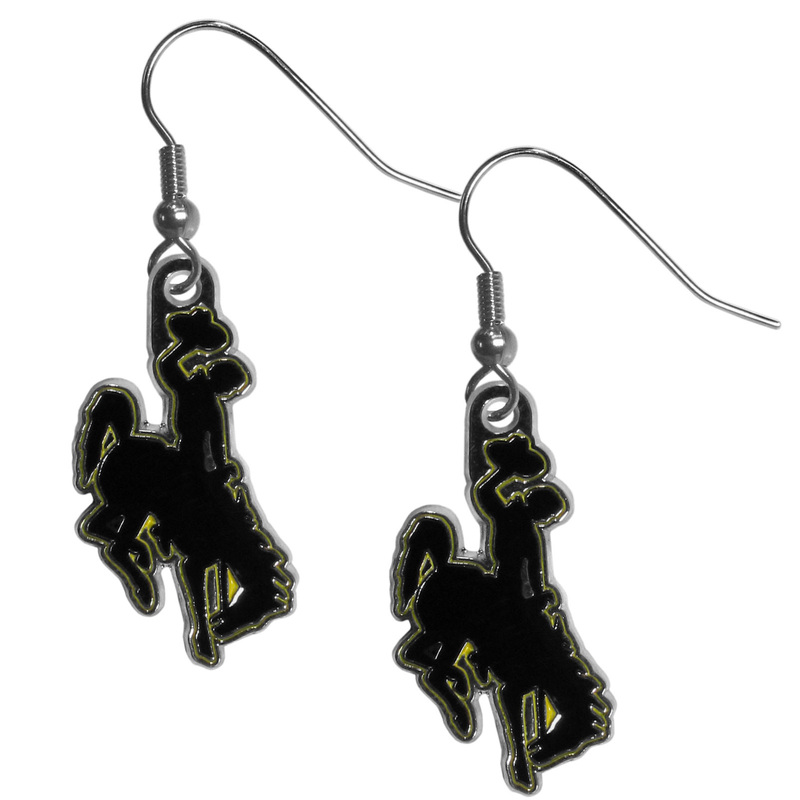 Our officially licensed chrome dangle earrings have fully cast Wyoming Cowboy charms with exceptional detail and a hand enameled finish. The earrings have a high polish nickel free chrome finish and hypoallergenic fishhook posts. Our crystal dangle earrings are the perfect accessory for your game day outfit! 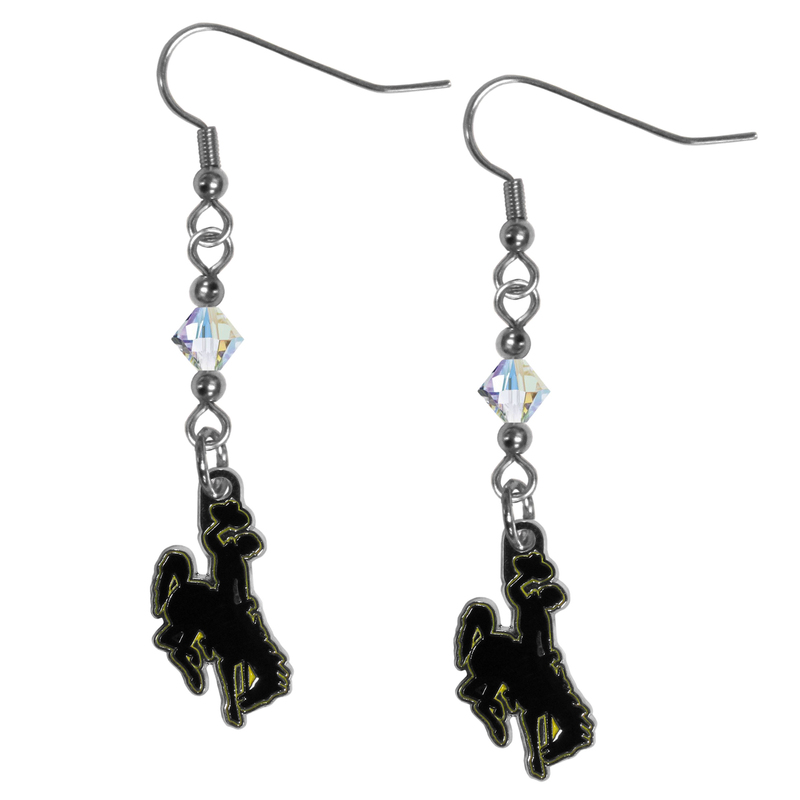 The earrings are approximately 1.5 inches long and feature an iridescent crystal bead and nickel free chrome Wyoming Cowboy charm on nickel free, hypoallergenic fishhook posts. 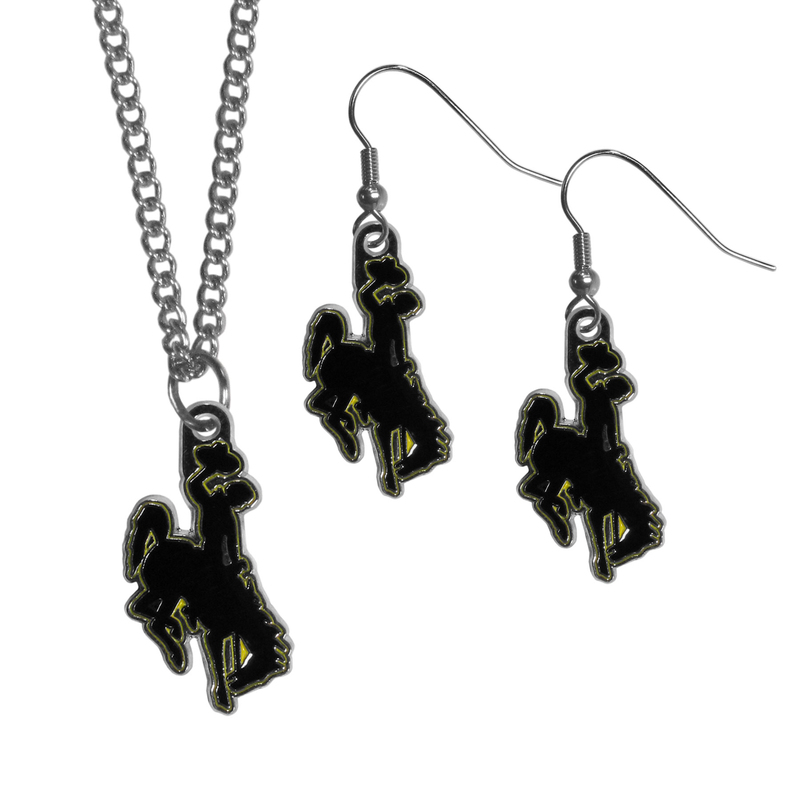 This classic jewelry set contains are most popular Wyoming Cowboy dangle earrings and 22 inch chain necklace. The trendy, dangle earrings are lightweight and feature a fully cast metal team charm with enameled team colors. The matching necklace completes this fashion forward combo and is a spirited set that is perfect for game day but nice enough for everyday. 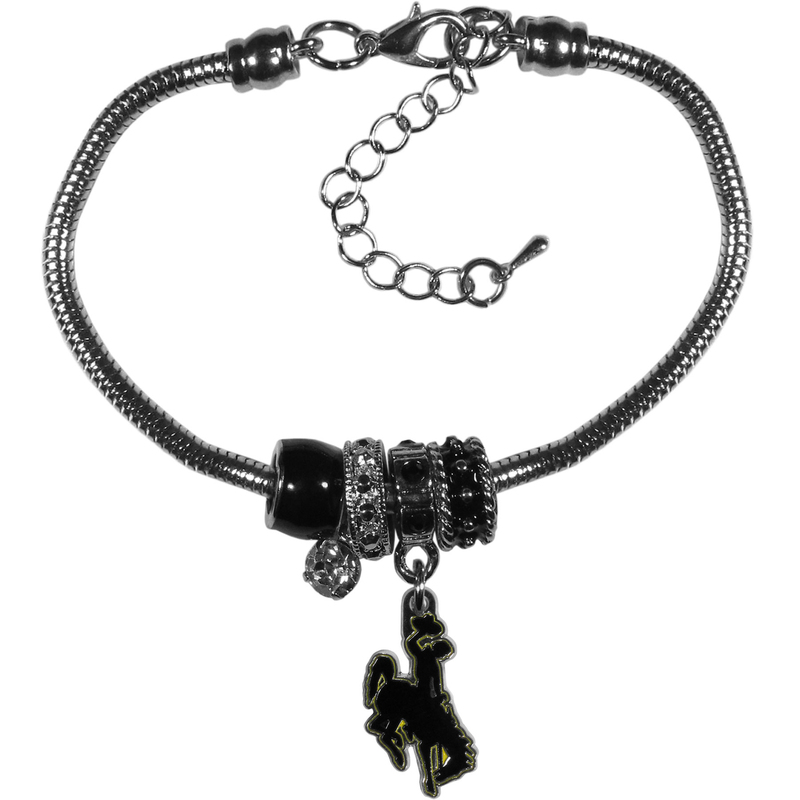 We have combined the wildly popular Euro style beads with your favorite team to create our Wyoming Cowboy bead bracelet. The 7.5 inch snake chain with 2 inch extender features 4 Euro beads with enameled team colors and rhinestone accents with a high polish, nickel free charm and rhinestone charm. Perfect way to show off your team pride. We have combined the wildly popular Euro style beads with your favorite team to create our Wyoming Cowboy bead necklace. The 18 inch snake chain features 4 Euro beads with enameled team colors and rhinestone accents with a high polish, nickel free charm and rhinestone charm. Perfect way to show off your team pride. 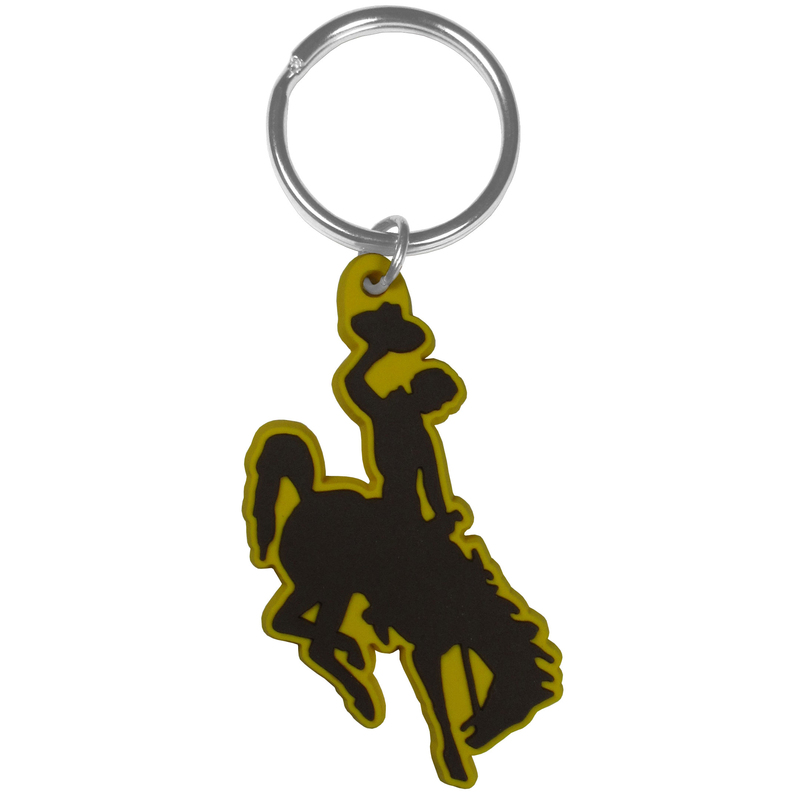 This fun, flexible Wyoming Cowboys key chain is made of a rubbery material that is layered to create a bright, textured logo.